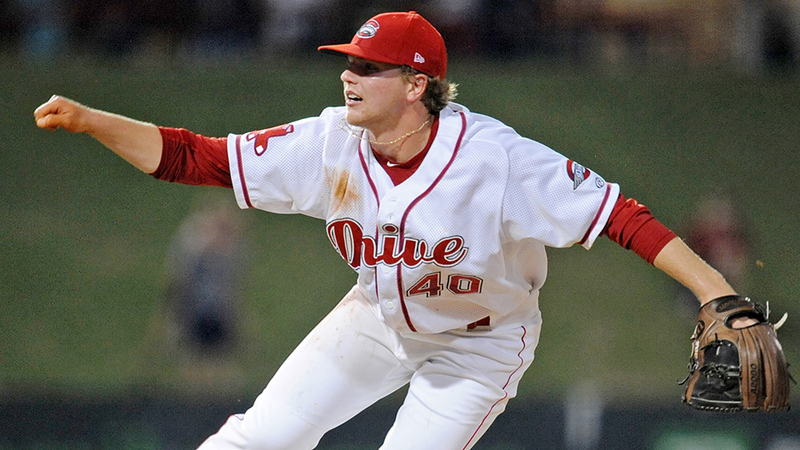 The first time Durbin Feltman was promoted, he was about to board a team bus for a five-hour road trip from Lowell, Massachusetts, to Auburn, New York. Scheduled to pitch every three days out of the Class A Short Season bullpen, he was next slated to take the mound July 11 against the Doubledays -- the first of a three-game series at Auburn -- so he was trying to mentally prepare for his fifth career Minor League appearance as well as for the long ride ahead on I-90. That is, until he was told to hang back for a second. "I figured that could mean only one thing," he said. The second time Feltman was promoted -- just three weeks later -- he was taking an ice bath in the Class A Greenville clubhouse, thinking less about the future than the freezing water he was immersed in when a coach demanded he get out for a meeting in the manager's office. He threw a Gatorade towel around his waist, some slides on his feet and went where he was told. The news came fast. Congrats, he was on his way to Class A Advanced Salem. "'Can I put on a shirt or something?' was my thought," Feltman said. "I really didn't see it coming. They wanted me to focus on where I was only, so all those moves weren't things I was really considering at the time." He played for three Minor League teams from the time the Red Sox took him in the third round of the 2018 Draft to the end of the year. And he could be gearing up for another quick climb in 2019, with the season drawing near and Boston's bullpen remaining the Major League club's weakest link. Feltman's potential rapid ascent to the Majors makes sense, considering his successful history as a reliever. Undrafted out of Oak Ridge High School in Conroe, Texas, the 6-foot right-hander became a force in the Texas Christian University bullpen shortly after arriving on campus. He posted a 1.56 ERA and a 0.75 WHIP with 49 strikeouts in 34 2/3 innings as a freshman, picking up nine saves. He ranked second in the nation with 17 saves the following year, even as his other stats backed up a bit (3.64 ERA, 1.28 WHIP in 29 2/3 innings). Last spring, he tied current Marlins Rule 5 pick Riley Ferrell for the program saves record with his 32nd on April 27. However, a shoulder strain set him back a month. He returned for two final appearances in the Big 12 tournament, going without a save in either to finish his collegiate career deadlocked with Ferrell. Still, all Feltman's traits were on display heading into the Draft. When he returned to action, his numbers were again brilliant. He had a 0.74 ERA, a 0.74 WHIP, 43 strikeouts and six walks in 24 innings. His strikeout rate jumped from 11.2 K/9 as a sophomore to 15.9 as a junior, and his BB/9 fell from 4.6 to 2.2 in the same period. Despite the missed month, he was named a Baseball America Third-Team All-American. In terms of stuff, his fastball hit the mid- to high-90s with plenty of life, and his slider also received plus grades. He was dinged in part for his delivery, which features plenty of motion, and there was some worry it could have contributed to the shoulder woes. However, the righty called the strain "an isolated incident" and blamed an increased workload for the timing of the injury. In fact, he credited improvement in his motion with his better results in 2018. "Sophomore year, my control was very spotty. Our assistant coach, Kirk Saarloos, showed me this video of my delivery as a sophomore vs. [as] a freshman, and I could see I was moving really fast and way too out of control," he said. "That's why my command was all off. So I adjusted before junior year, slowing things down, making it smoother, and I had a little more control. But, yeah, it used to be a lot worse." The Red Sox liked enough of what they saw to take Feltman 100th overall last June and sign him for $559,600, equal to the slot bonus for the pick. Feltman made his professional debut on June 29 and was nearly perfect in his four appearances for Lowell, striking out seven without allowing a hit or a walk in four scoreless innings. The only New York-Penn League batter to reach against him came in his pro debut on a fielder's choice. He first surrendered a hit in his Greenville debut on July 11 (and struck out the next three batters), but didn't allow an earned run until his seventh pro appearance five days later. On July 19, his perfect ninth inning closed out the third no-hitter in Drive history, and two weeks after that, he was wearing a Salem uniform. After 11 outings with Boston's Carolina League affiliate, he finished his first Minor League season with a 1.93 ERA, a 0.99 WHIP, 36 strikeouts and five walks in 23 1/3 innings. He'd also notched four saves in four opportunities, showing he can handle the fire of professional ninth innings just as well as he did the flames of the college game. The chance to close came from a level of trust from his organization not typically shown to players in their inaugural seasons. "They basically said, 'Hey, you're here for a reason. Do what you do,' so they let me go a little bit," he said. That isn't to say Feltman didn't learn a few lessons and put them into action as the season went on. "One thing I did in college was pitched down in the zone," he said. "That was consistent for me. But when I got the pros, I could see I was still striking guys out with belt-high fastballs. The spin rate was still hard to pick up up there, and I could use the slider off that. Rather than relying on the coach calling the pitches, I knew I could pitch the top of the zone like the other pitchers, and that really kicked in at [Class A Advanced]. Other than that change, I always thought that my strengths are better than your strengths. A good pitch is always going to beat a good batter, so I just need to keep throwing good pitches." Heading into his first Spring Training, Feltman finds himself in an interesting situation, given the state of the Boston system. The World Series champs have lost postseason hero Joe Kelly to free agency. Closer Craig Kimbrel remains on the market, but president of baseball operations Dave Dombrowski has said he doesn't expect the club to make a big splash for a free-agent reliever. The absence of those two amounts to 128 innings of high-quality relief Boston will need to fill, let alone the fact that their late-inning roles are vacant. Matt Barnes and Ryan Brasier seem best positioned to bear the weight of closing, but the former has never posted an ERA lower than 3.65 in the Majors and the latter was pitching in Japan in 2017. There's a real opportunity for a dominant reliever -- especially one with special stuff and late-inning experience already on his resume -- to rise through the ranks and claim a spot in the bullpen at Fenway Park. "I've seen a little bit on Twitter like everyone else," Feltman said of the Major League roster situation. "But at the end of the day, I'm not too worried. If I do as well as I can, it'll work out. Of course, I know that the door is a little more open now than it might have been, but I feel like it's going to come down to me showing them what I can do and taking care of business wherever I go." It's possible the organization keeps moving Feltman up the chain with an opening assignment to Double-A Portland, thus making him Boston's first top-10-round Draft pick to open his first full season at Double-A or above since Craig Hansen started with the Sea Dogs in 2006. Of course, the 2005 26th-overall pick also pitched in the Majors in his Draft year, a leg up Feltman did not enjoy down the stretch in 2018. Even if Feltman opens back with Salem, the Red Sox have shown they're willing to get aggressive with the closer if he continues to dominate. That would make him the relief pitcher version of Andrew Benintendi, who opened 2016 in the Carolina League and ended it in the American League Division Series. In other words, Feltman might want to keep an extra shirt handy the next time he gets in an ice bath in a Minor League clubhouse. "[Closers are] definitely a special breed. When I got hurt, our eighth-inning guy had to pitch there, and he told me afterwards that closing is just a little different than setting up. You're riding that border between cockiness and confidence. You have to," he said. "With my game and my stuff, I'm going to dare you to hit it. I've just got to get through that inning, so I'm putting all the cards on the table. I like the chaos around it. It takes a special person, I think, to feel that way. You have to be a little psycho."